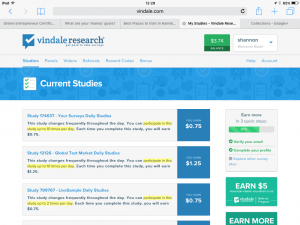 Vindale is a research outfit who pays cash for your time in taking online surveys. At no cost to sign up all that is required is an email address and a working internet connection. The surveys vary from 0.25 to as much as $50 depending on the scarcity of participants. The most I’ve seen being paid out was about $2.50 for a 58 min survey. The duration of the surveys vary from 6 minutes up to an hour. The surveys that are offered can be from cosmetics, to auto parts, to medicines. This company has offered me 2 bucks just to sign up and I completed one survey for a $1.76 bringing my total to $3.76. I have just signed up for it so I haven’t been able to see a payout but I do see the wheels turning and I will be sure to give my honest opinion on this money making opportunity or this hoax to consume your time. One day I was cleaning my email box out and read where I can make money online with my opinion. Upon reading further I found it to be free of charge and all I needed was an email and just some time out my day. Well I am always looking for something to pass the time during my commute to work as reading can sometime cause me to miss my stop. If I web surf anyways why not take surveys and get paid. Now the payouts aren’t huge but I plan to do 2 in the morning commute and 2 in my evening commute. Now majority of the surveys last no longer than 20 mins a piece and mostly 1.15 on average is the payout to complete the work. If my math is correct by rounding down 4 dollars a day times 30 days is 120 dollars a month just for taking surveys. $1440 by the end of the year is what can be made using this model to follow. Who can benefit from VIndale research? The program really is easy to join and easy to follow. They send an email whenever surveys are ready so the person first come first will be served. Anyone who can read and follow instructions can benefit from this change maker. The numbers add up if you don’t touch it. However it can also be used as seed money for small investments or saved to be used for bigger investments. From the phone addict teen to the grandma just catching up with technology Vindale is made easy for all to part take. Vindale offers more than just surveys to get paid. There is panels you can join where you sit on a panel and participate in a controlled study and earn just a little more than a survey. 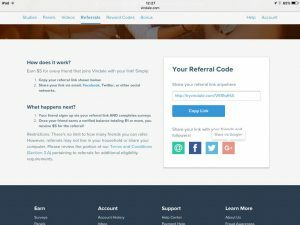 There is also the referral program where you can earn $5 for every sign up that uses your link to join. This may not sound like much but again it adds up. By it being free it shouldn’t be hard to get someone to just sign up. This is what got my attention to consider this program. It offers more than one way to earn extra income. Soon to come will be a video feature where you can earn .50 per video viewed. Payday is on the 1st and 15th of each month by check or Paypal. What at kind of support in place? This I can’t speak to sure because I have yet to use the program enough to need support. I will figure this out during payday and give you guys an update when I email support for help. They can be followed on Facebook and Instagram so I’m figuring support may be ok just not for sure right now. Vindale research isn’t a program for you to make a lot of money and get rich. Vindale is for those looking to earn something a little extra on the side. If you don’t do it often A LITTLE is all you will get. At an avg of .75 cents 20 surveys can get you $15, and if you do that weekly without fail those numbers will climb. 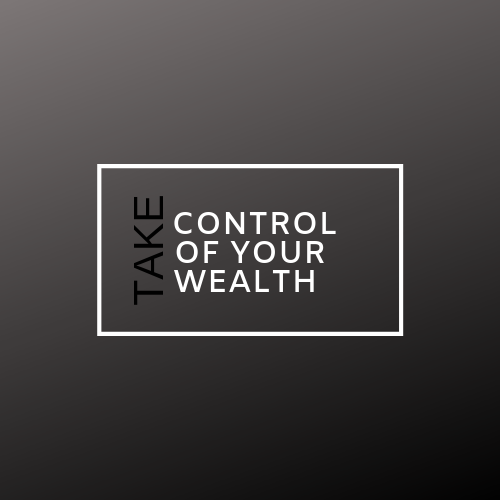 Add in any number of referrals and the payout can be worthwhile to put away for retirement or investment. I totally recommend this product to anyone who needs to pass time during commute, need extra money for the pocket, or at home with nothing else to do. Why not make a little change while doing it? Next post: My habits will determine my outcome! Hi Papa Jones, thank’s for the news, I think I will not get into surveys. It seems it takes a lot of time to get just a little money. I am glad someone is opening the cards on this subject. 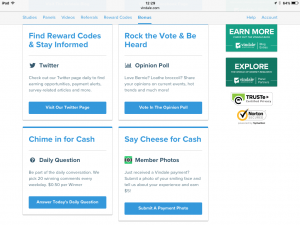 It always sounds so good, make money by filling out surveys. but money can be made in many different ways. Thank’s again and have a great time. Thank you for your input Stefan! This isn’t for those who hold money on a pedestal but for those who knows every penny counts when saving! If 1hour and 20 mins a day can yield 60 bucks a month then at least my W.A is paid for. In six months time I now have 600 to invest in stocks to trade. If you’re trying to get “RICH” then this isn’t for you, but if you’re trying to get paid you can’t lose!